This photo of a DIY bike wash at A Child’s Garden pre-school in Covedale, Ohio, has been posted and reposted across the internet – folks just love this cool idea! But how would you MAKE it? Okay, kid-makers, get started on your own Backyard Bike Wash with this basic Instructable for a “KidWash” sprinkler arch. For a second, more advanced version that uses misters, click here. This project costs less than $10 to build. Once you’ve built the basic arch, it’s time to get creative! Imagine the familiar elements of a car wash – sponges, hanging strips and water coming from different angles. You can use sponges from home or pick up some at your local dollar store. For strips, we recommend flagging tape (which you can find in different colors at any hardware store) because it is waterproof and will hang softly for riding through. But you could also use wrapping paper ribbon, jump ropes or cut strips from an old tarp. Put the finishing touch on your Backyard Bike Wash with an official sign at the entrance and invite your friends over for hours of clean, cool fun! 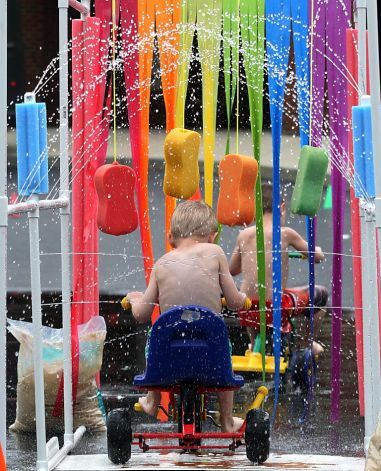 Check out our other fun ideas for backyard summer fun: Water Bottle Sprinkler and Homemade Water Slide.